Burnt red onion jam needs to be on your list of tips for making food taste fantastic. It is perfect with a steak or on pork. Mix it into your mashed potatoes for a special treat. Put some in cream cheese and spread it on a toasted baguette. The possibilities are nearly endless for this easy condiment. In the last couple of weeks Mary Jo and I had it with pan grilled rib eye steaks. Then, while Mary Jo was out of town for a few days, I made a pizza with a simple red sauce then spread on some burnt red onion jam and topped it with fresh mozzarella cheese. (That was delicious BTW). Tomorrow we will have it on toasted baguettes topped with goat cheese. Now that’s only a few ways to eat this very tasty jam. You can eat this warmed up or cold. For warming, place some into a small non-stick pan and heat on medium low until it is heated up. This is probably the easiest thing you could make and I don’t see how this could fail. 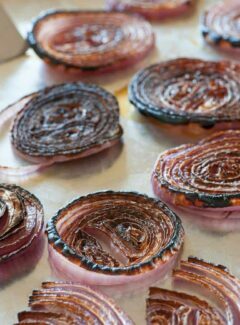 Place about 6 inches under your broiler, on a baking sheet sprayed with cooking oil, for around 12 minutes until the onions tops have a nice char. Take out of the oven to cool slightly. Place the onions in a small food processor with around 2 tablespoons of good, thick, balsamic vinegar, and a tablespoon of capers and pulse until the onions are coarsely chopped. (Or leave out capers…your choice). Taste and add salt if necessary, then put into a jar and store in your refrigerator for up to 7 days. Once you make this and taste it I’m sure you could think up numerous ways to use it. 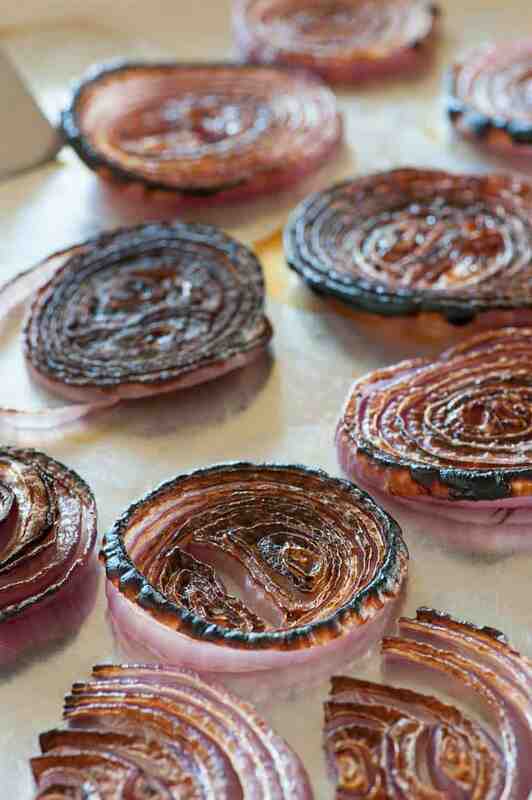 Just the smells coming out of your kitchen when the onions are broiling will perk up your senses and start giving you thoughts of deliciousness. Besides having it with a steak, pork chops, on a pizza, or on a baguette, mix some in with mashed potatoes. Have it on the side with roasted vegetables, especially with hearty root vegetables. How about with fried eggs and toast. It would be delicious with fried mashed potato patties or cauliflower patties such as these. 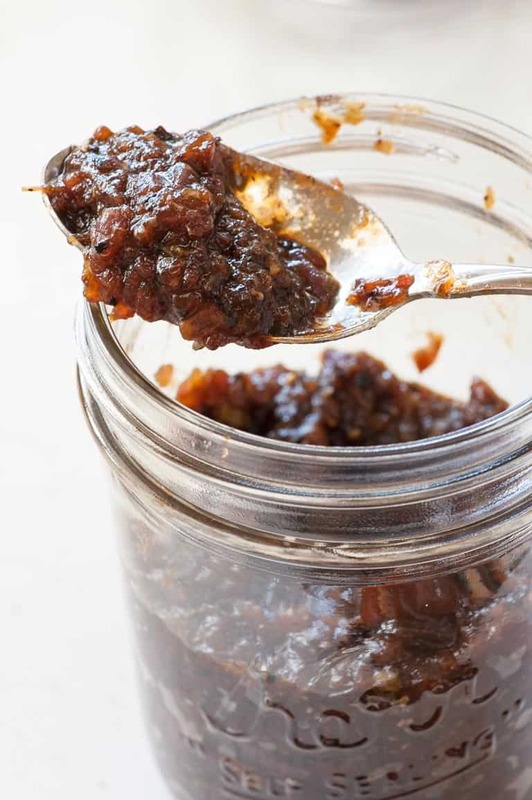 Anywhere you need a flavor boost, this umami packed burnt red onion jam could be used. The burnt red onion jam only takes about 20 minutes to make and I guarantee you will love it. How about making it tonight? 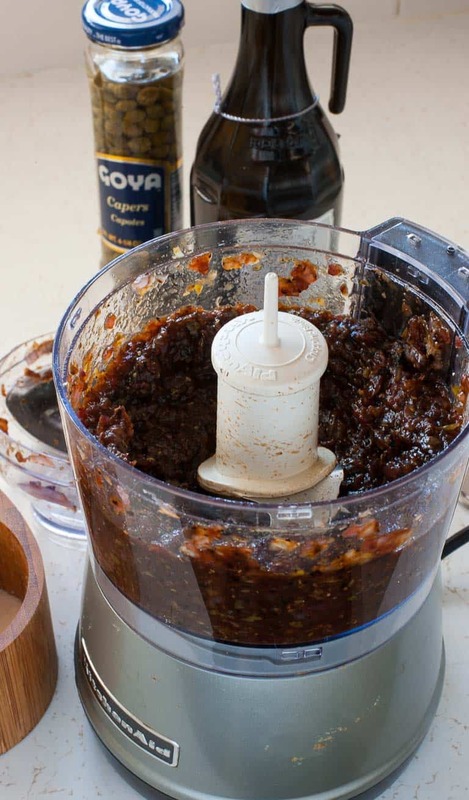 Tasty, simple to make condiment that can be used in a number of ways. One entire batch as presented has a total of 128 calories. Recipe is adapted from Tasting Table. Oh, so good and so easy!